Product prices and availability are accurate as of 2019-04-08 18:47:17 UTC and are subject to change. Any price and availability information displayed on http://www.amazon.com/ at the time of purchase will apply to the purchase of this product. 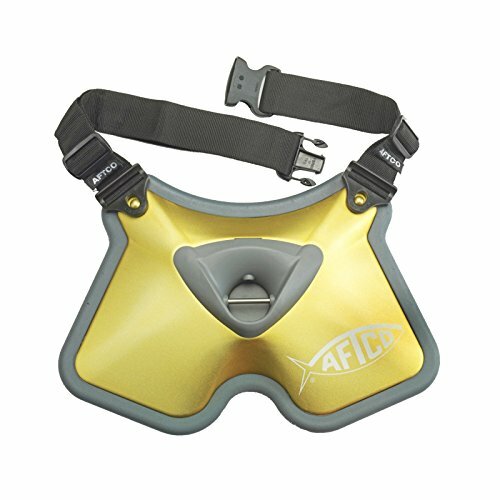 With its advanced design, materials and comfort, the AFTCO Clarion(tm) is the ultimate fish fighting belt for big game fishing. The super-thick, closed-cell EVA foam back pad is engineered to maximize both comfort and leverage, so that when the belt is positioned relatively low across the thighs, the load is distributed evenly for maximum pull when fighting big fish stand-up style. Co-molded to the foam back pad is a heavy-duty, yet lightweight gold-anodized, stamped aluminum front plate. Super durable, it features posts at each side that accept unique Quick Clips, which "snap" the belt straps (or optional drop straps) in place for quickly getting into or out of the belt. Also featured is a super strong, molded glass-filled nylon gimbal pocket that is engineered to quickly guide rod butts into an optimum fish-fighting position. The gimbal pocket's stainless steel pin is adjustable for horizontal or vertical orientation. A perfect match for the AFTCO MAXFORCE harnesses, the Clarion(tm) fighting belt measures 19 inches wide by 13 inches high, and if it falls overboard, it floats! The super-thick, closed-cell EVA foam back pad is engineered to maximize both comfort and leverage Co-molded to the foam back pad is a heavy-duty, yet lightweight gold-anodized, stamped aluminum front plate Super durable super strong, molded glass-filled nylon gimbal pocket that is engineered to quickly guide rod butts into an optimum fish-fighting position The gimbal pocket's stainless steel pin is adjustable for horizontal or vertical orientation.